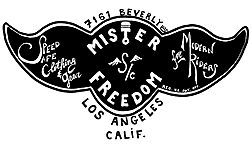 This was the discovery of an incredible story, that of a Southern California family of three brothers: Lino, a local prize fighter and trouble maker, Marlon, an Army trained airplane mechanic turned hill climber and Eddie, the artist with tailoring skills. 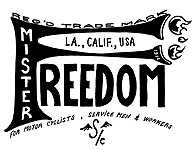 All devoted cycle riders, they opened a Los Angeles Club House/garage in the 1920′s. It became a spot to hang out if you needed tools or spares for your cycle, or just wanted to cool off and talk ‘pistons ‘n broads’. 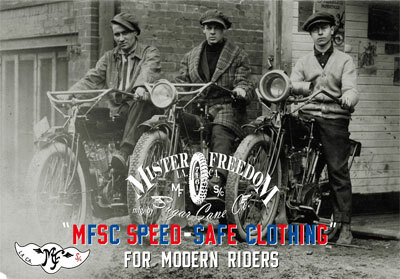 At the time, motor-cycling was a newborn method of transportation, and riders had to settle for military or workwear clothes and make the best of them. Feeling the need for specific motorcycle riding gear, Eddie started designing and making clothes all the brothers could wear, on and off their bikes. For the production, military hardware, close out fabrics and trims were used in the manufacturing. The port of Los Angeles was a busy place and anything was available for who knew where to look. Lino did. The clothes were purposely designed, sturdy and durable: a riding jacket, work shirt or dungarees had to last you a good chunk of years and help you “keep the rubber down”, focused on the road and not your back. * Lino’s “Mulholland Master” riding coat and leather “Greaser” cap. 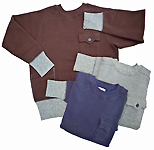 * Marlon’s leather “Bronco Champ” racing jacket, “Mechanic Shirt”, “Mechanic Sweat shirt” and “Mechanic Cap”. * Eddie’s denim “Rambler Pack”. * The brothers’ favorite denim “Rider’s Dungarees” and “Club Shirts”.